TL;DR I purchased some cryptocurrency mining power in the cloud. 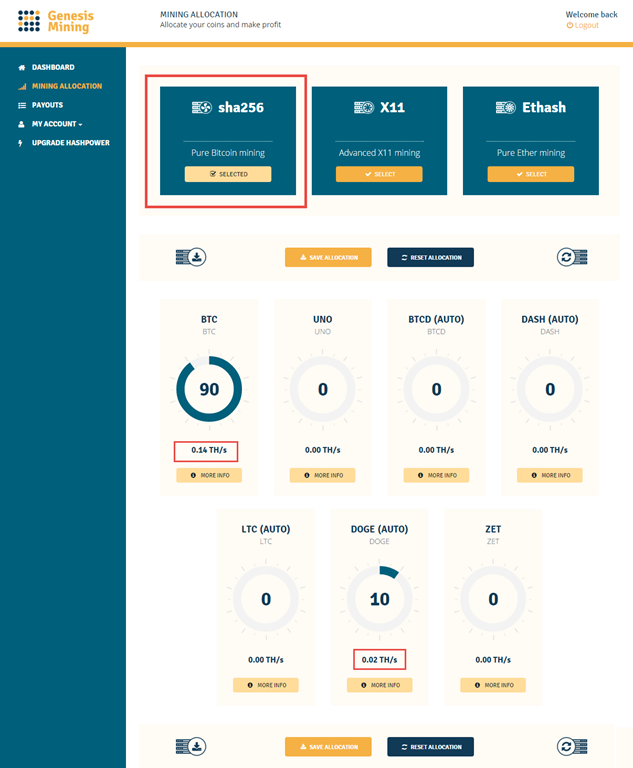 I found that SHA256 mining is not that great, but Ethereum mining is more profitable. I plan on investing in more mining power. 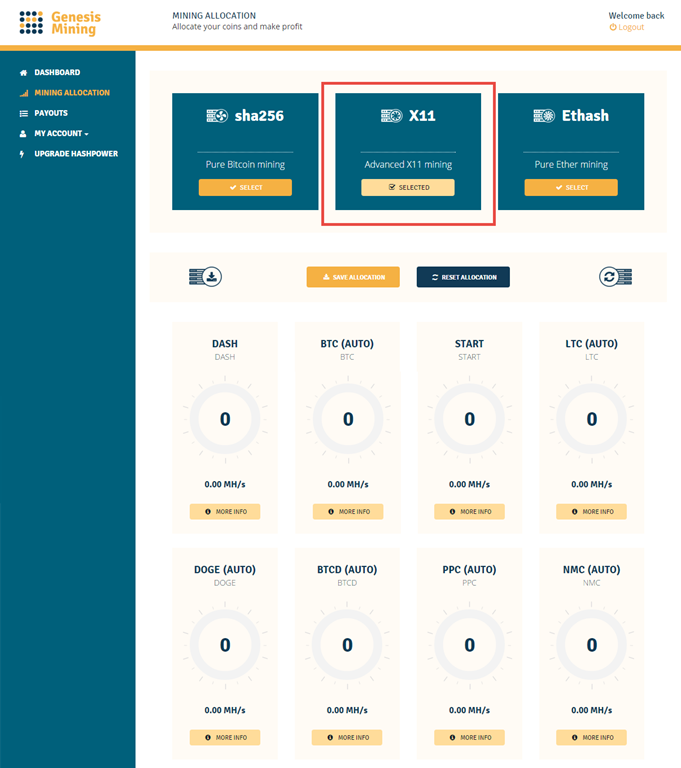 Previously I blogged how to mine Bitcoin on Azure (and why it is a terrible idea). In it I concluded that CPU mining is terrible with the advent of cheap USB ASIC miners and that you are better off purchasing one of them rather than wasting cloud computing credits. I did more research and discovered rather than purchasing hardware, and running them myself and paying for electricity, maintenance, etc. I could just purchase raw mining power in a specialised mining datacentre. 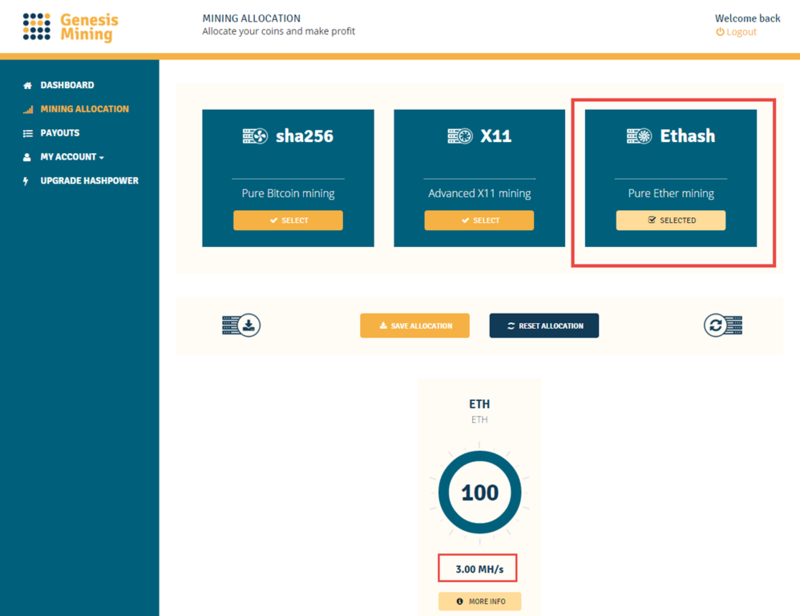 I liked that sign up was simple, that you could allocate your mining power/payouts (see below) and most importantly that it had Ethereum miners (look out for future posts on Ethereum!). 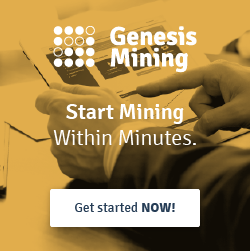 The reason I liked Genesis Mining was how you could allocate your mining and payouts across the many altcoins. Below I’ve included screenshots of the payout screens and my configuration. The original Bitcoin hashing algorithm. 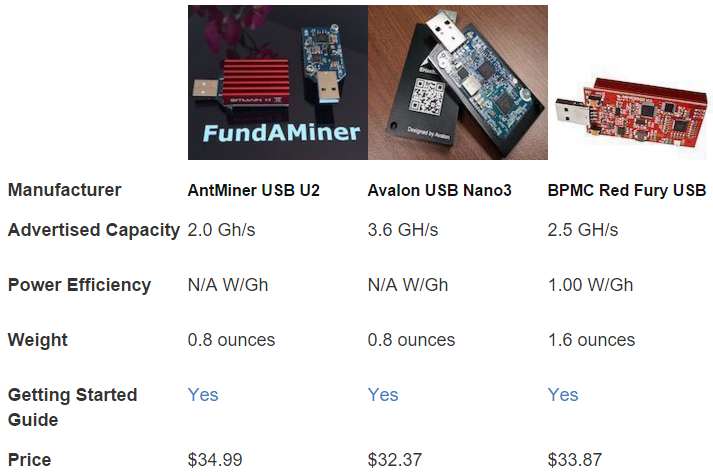 Mining power is being added to this at a crazy rapid pace with ASIC manufacturers trying to cash in and mine as many Bitcoin as they can. Profitability of mining this will drop rapidly. Here I allocated my payouts as 90% Bitcoin (as that was the point of the exercise) but then 10% into Dogecoin. Dogecoin was created as a “fun” cryptocurrency and the development community has fun with using it as tips throughout Reddit. I wanted a small trickle of this so that I could tip people. Built to be more ASIC resistant by incorporating 11 different hashing algorithms. I haven’t purchased any mining power in this mining algorithm yet, but I plan to in the future. Not much in the way of options, as it has been designed to be a unique ASIC resistant algorithm. This is just for Ethereum mining. I’ve been mining for 9 days now and thought it would be a good time to analyse how my mining has been going. Payouts occur at the same time every day, meaning my 1st day only saw a partial payout on the day I signed up. I have removed the datapoint to make the graphs clearer. 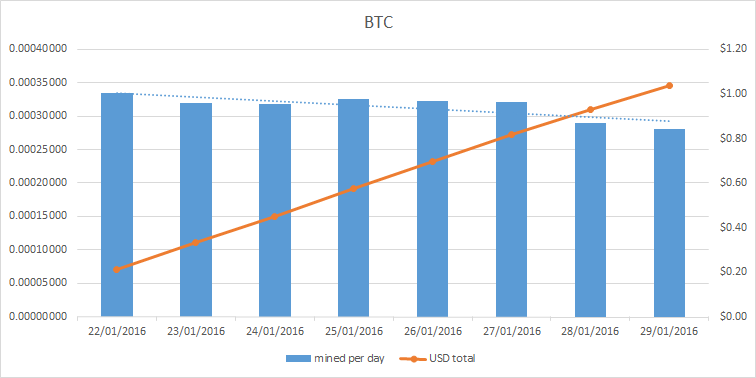 The amount I’m mining each day has been trending very slightly downwards but is more or less stable. 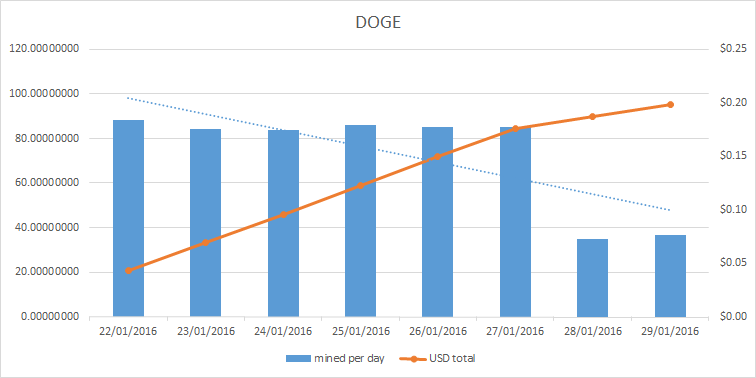 A very sudden drop in Doge earned per day. This can be explained by looking at the exchange (see graphs below). Dogecoin isn’t mined directly by Genesis mining, but instead Bitcoin is mined and then converted into Dogecoin. Over the last 3 days the price of BTC has gone down while DOGE has gone up, meaning during the daily conversion of earned BTC to DOGE the exchange rate is lower. ^I do not believe that this will be the true yearly values. Exchange rates will fluctuate and amount mined per day will go down. I was interested in the SHA256 miners because of the lifetime contract that will always be mining until it is no longer profitable. However I am wary of the long term profitability of it. 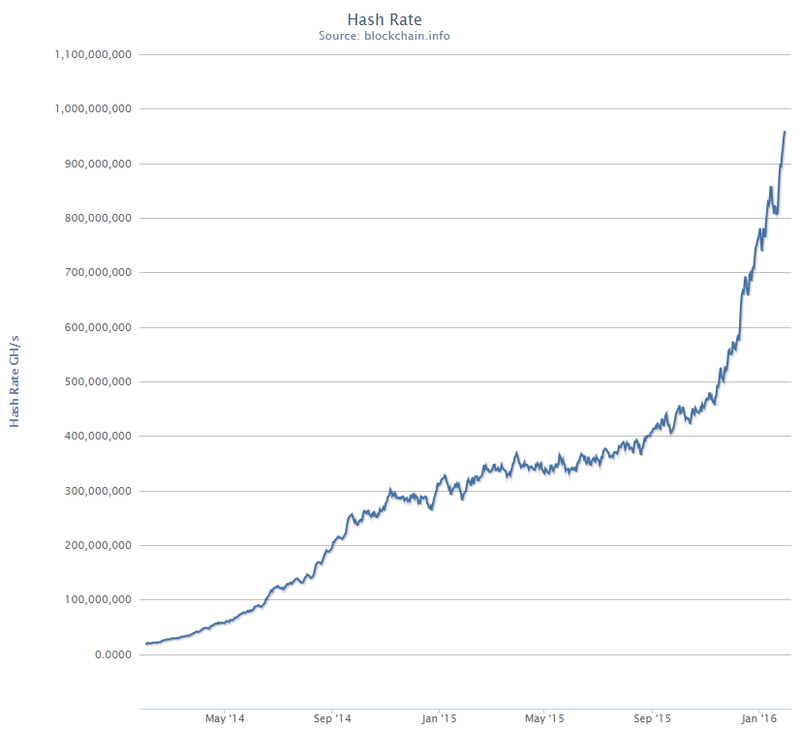 The chart below from blockchain.info shows the crazy rate that ASIC miners are are bringing on more hashing power. This will rapidly diminish the amount of BTC I mine per day. 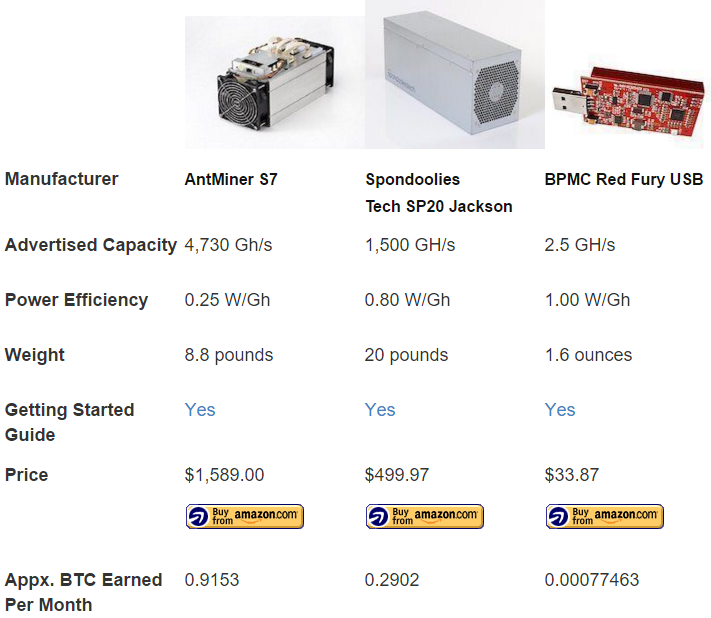 I do not plan to invest more in Bitcoin mining as I don’t think it will economical to compete. 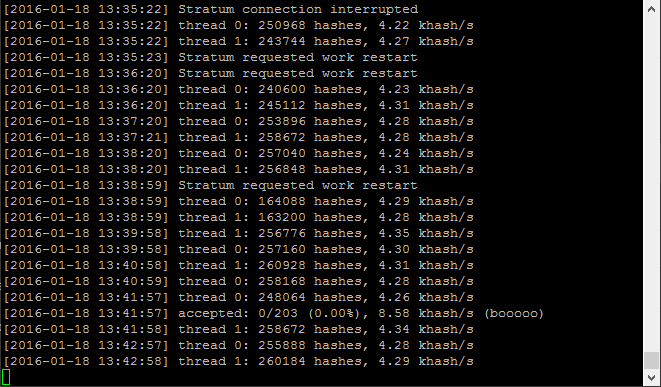 I am very happy with the progress of my Ethereum miners. Ethereum is more resistant to ASIC miners and therefore the amount of global mining power brought should not reduce my profitability as much as quickly as it is with SHA256. 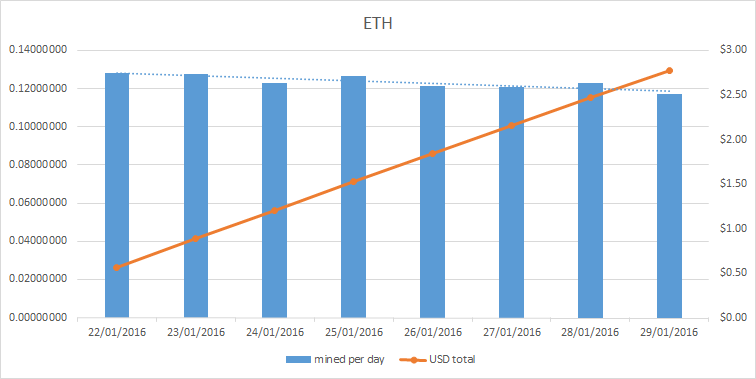 Ethereum mining is also almost 3x as profitable per $ as SHA256 mining (0.0052 vs 0.0018). Because of this I plan on purchasing more Ethereum mining power as well as some X11 mining power. But I will not be investing any further in SHA256 mining. I’d like to get some data points from the X11 miner to share next time.